Sounds Like Sunset's Saturdays is a swirling combination of hook-driven rock and atmospheric, slightly spacey ambiance, a melodic team that swims around in your head constantly while the mesmerizing songs dance and sparkle note after note. Front man Dave Challinor's falsetto on the opening track, "Each Time You Smile", quickly wins you over, the music a blend of melodic rock and sonic, My Blood Valentine-esque guitar composition. There is no turning back from there, and no reason to. 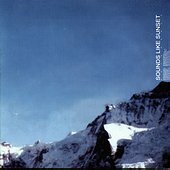 Unlike some bands that stack their album, leaving the listener less and less interested as the album progresses, Sounds Like Sunset build it like a painting. Using the first song as the canvas, each additional track is a brush stroke, the final picture a collection of everything that lead to the end. The magical thing about it is when it ends, you want to go back to the beginning and experience it all over again. The swimming-in-your-head guitar tones and rhythmic bounce, the emotionally candid lyrics, and the spectacular use of guitar layers set atop a bare bones guitar-pop structure, wins you over with little to no struggle. This is the type of record that, much like Australia, where the band resides, is sunny and warm, packed with a lot in a relatively small space, yet still has its edge, plenty of wilderness to roam and explore. "Unfair", "Sing Forever", and "Inflight Movies" are just a few of the mind-blowing numbers on this record. I'll give it an A.